When I first started this project, I had hoped to be able to link pewter usage to the political and economic pressures of the time. I thought that when times were good and tin could be easily obtained that the amount of pewter used on each stein would be at a maximum, and the amount of pewter would be minimal when times were bad. This only seems to be the case after the Franco-Prussian War. Before that time, it would appear, the opposite was true. Prior to the late seventeenth century, tin, the major ingredient in pewter, was mined in only three European countries, England, Saxony and Bohemia. But production had dropped off in Saxony and Bohemia after the 30 Years War (1618-1648), and the deposits were pretty much played out by the time the Dutch started to import tin from Siam (Thailand) in 1680. So, after 1680, Germany was dependent on England and Holland for its tin imports. During the 58 years between 1690-1748 when many of the steins being manufactured were utilizing the maximum amounts of pewter, for example, they had footrings, lid rings, large, fancy lids, large, ball type thumblifts, handle reinforcement straps and general repairs made from pewter. Bavaria and a number of other German states including Prussia, for at least 32 of those 58 years, were at war with England and Holland and tin should have been difficult to come by. On the other hand, from 1748 until 1914, no German State was at war with either England or Holland, and except for internal struggles, greater Germany appears to have been at peace until the Franco-Prussian War of 1870-71. The Napoleonic Wars of 1804-15 were an exception of course, but besides getting a lot of French and Prussian soldiers shot up, Napoleon did very little damage to the rest of Germany. True, Prussia stood up to him, but the other German states either sided with Napoleon or simply chose not to oppose him. As a reward, he made Bavaria and Württemberg kingdoms, established the Federation of the Rhine and in all these places saw to it that the people were given social and economic freedoms that they had never experienced before. Prussia was forced to extend these same freedoms to its people, but it retracted most of them after Napoleon's defeat at Waterloo in 1815. The two things that Napoleon did which had the greatest effect on European society were: one, giving the peasants the right to own land, thus allowing farmers to move to the towns and burghers to relocate to the countryside; and two, disbanding the large merchant and craftsman guilds. Napoleon decreed that each man had the right to earn as much money as he was able through the occupation of his choice, and that competition was the key to economic well-being. This meant that the unregistered and itinerant craftsmen including pewterers known as "bonhasen" (ground rabbits), who had been a major irritant to the guilds by undercutting their prices, were now free to settle down, open shops of their own and compete freely. However, during those 166 years of relative peace (1748-1914) when tin was readily available and labor costs had apparently come down because of the competitive market, instead of massive pewter fittings as we might expect, we see the amount of pewter being used on each stein becoming less and less. There can only be two reasons that this would occur, one is a matter of preference and the other necessity. The pewter on our steins is entirely protective in nature, the lid protects the contents; and the lid ring and footring protect the rim and base from chipping and other damage just as the handle support strap protects the handle. Regardless of how fancy these fittings are, their function is strictly utilitarian. Faience and glass are both subject to easy damage, so I doubt that the reduction in size and eventual deletion of some of these fittings was one of preference. I must conclude that this was a matter of necessity, and that the industrial revolution and the demand for tin in the manufacturing arena, placed such a premium on the price of tin that it simply became too expensive for everyday use on beer steins. During the 1850-65 time period, we find that pewter fittings were reduced to the barest minimum, small diameter hinges, lids made of thin rings holding either glass or ceramic inserts and fragile thumblifts. After the Franco-Prussian War, the price of tin must have gone down, because from 1875 to about the turn of the century, the less expensive steins, stoneware and glass, tended to have fancy pewter lids and thumblifts, but the more expensive steins, such as the Mettlach chromolith pieces, in order to remain competitive, were still supplied with ceramic inlaid lids. Fancy pewter was an option of course, but due to the cost of producing the steins, the increased cost generally put them out of the range of the average working man. There seems to have been no shortage of tin for pewter right up to 1914 and the beginning of World War 1. After the war Germany couldn't buy tin because of its strategic importance and, of course, the fittings on our beer steins suffered particularly during the years 1919-1924. Later, during the 1934-1939 time frame, due to the armaments build up preceding World War II, we also find a shortage of pewter. In dating our steins, we usually can't date them to an exact year, but we can date them to a time period such as c.1725 or c.1920, etc. All pewter styles as well as body and handle styles, overlap somewhat so a study of body and handle styles can help narrow the time period in which your stein was manufactured. However, the scope of this article precludes my covering this aspect and is limited to the pewter. If you are interested in learning something about body and handle styles I suggest Gary Kirsner's "The Beer Stein Book" and a video available through SCI by John Stuart called "Dating Glass Steins." Dates on steins mean very little. About the only steins we can be sure were made at the time of the dates that appear on them are Mettlach steins, Regimentals and Official Fest Krugs such as a stein commemorating the 1910 Oktoberfest, etc. The reason a study of body and handle styles is important is that you will encounter steins where the body and the pewter are from different time periods. Although no time period is immune, I find this occurs most often on steins from the 1830-1860 time period. The pewter had worn out, was contributed to a war effort or lost for any number of other reasons, and was replaced at a later time after the pewter styles had changed. This usually means that these steins will be found with open hinges. This does not mean that open hinges were used prior to 1860. You must keep in mind, that once you have learned all the rules for dating your steins, that the most important rule to remember is that there are exceptions to every rule. Because I'm going to mention closed and open hinges from time to time I'd better explain what they are for those who might not know. If you look at the end of a hinge, and it is smooth with no pin showing, that is a closed hinge. If the pin shows as a small circle in the middle of the hinge, that is an open hinge. Basically the closed hinge was used until 1870-75 when the open hinge came into general use. Because this didn't happen overnight and the open hinge was phased in gradually over a number of years you will find there are a number of opinions as to when it actually took place. I personally have never seen a stein, verifiably made before the Franco-Prussian War, with original pewter that had an open hinge. The Modern era has a couple of smaller sub-groups. In order to save time and space I've used cut-away drawings and hope this doesn't confuse the issue. While this article won't make you an expert on dating your steins and their pewter, it may at least make it possible for you to pick up a stein in your local flea market (that the dealer has marked and priced as an antique) and know that it was made around 1950. 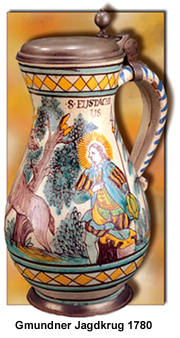 A stoneware jug typical of the 16th century, type similar to that illustrated by Albrecht Dürer. Pewter fittings prior to 1680 were boringly repetitious and provide little in the way of clues as to when they were made. The pewter usually consisted of a domed lid with a tiered finial, a large, closed, five-ring hinge; and the thumblifts were, for the most part, small and mounted over the hinge. Some of the earliest pictures we have of lidded vessels are stoneware jugs in the drawings of Albrecht Dürer from the early 1500s. 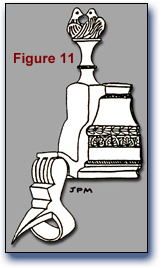 Figure 1 is an example of a stoneware jug typical of that time period. 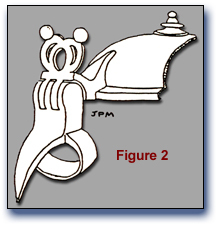 Figure 2 is pewter of exactly the same type as that used on the jug in figure 1 and is from a Raeren stoneware jug c.1600. 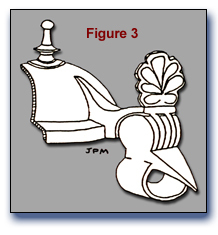 Figure 3 is the pewter from a Westerwald jug c.1675. As you can see, little had changed in 150 years. Pewter from a stoneware jug of Raeren c.1600. Pewter from a stoneware jug of the Westerwald c.1675. Pewter from a faience stein of Frankfurt c.1680. The Siamese tin that the Dutch were importing quickly entered the market place and soon after 1680 we see the pewter fittings on steins reflect the increased amount of tin that was available. 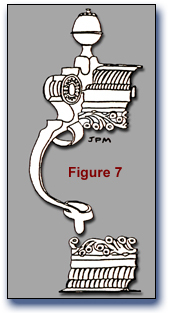 Fittings became more massive with large, ball type thumblifts, lid rings and handle reinforcement straps, and we still have the large, closed, five-ring hinge (See Figure 4). You will notice that the thumblift has migrated to a place of prominence over the lid. By 1700, virtually every stein being manufactured had a large, ball type thumblift over the lid. In the previous time frame, prior to 1680, stoneware dominated the market, but now faience was coming into popularity and would eventually push most stoneware out of the picture. Except for continuing production in the Westerwald, Duingen and Altenburg, most stoneware factories began to shut down, or at least discontinued beer stein production. During the reign of William and Mary II of England (1689-1702) and that of Queen Anne that followed (1702-1714), the amount of tin reaching Germany probably remained fairly constant as the pewter on steins produced throughout that period would seem to indicate. However, in 1714 when Anne died, having outlived all seventeen of her children, the Act of Settlement of June 12, 1701 took effect. This act declared that no Catholic may become king of England, and when the Stuart family no longer had any Protestant heirs Great Britain must turn to the German house of Hanover. So, George the Elector of Hanover, the Grandson of James I, became George I of England, the first Hanoverian king (1714-1727). This marked the beginning of the golden age of German pewter. Superb pewter from a faience stein of Ansbach c.1720. During this period there seems to have been so much tin available that pewterers were hard pressed to find ways to use it. It was no longer sufficient to be a technically proficient pewtersmith one also had to be an artist (See Figures 5, 6 and 7). Obviously, it was necessary to protect the faience steins, which are very fragile with a certain amount of pewter, but the amounts of pewter being used far exceeded that which was necessary. Pewter was so abundant that it was even used to make repairs during this time period. Sometimes, a hole in the bottom of a stein would be repaired by forming a false bottom of pewter. It was part of, and held in place, by the foot ring. 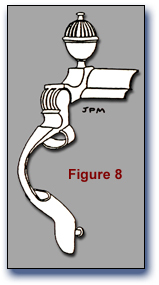 Figure 8 shows a handle repair replacing the lower portion of the handle with a pewter sleeve (or boot). It was soldered to the handle reinforcement strap and held to the body by punching a hole in the body of the stein through which a pewter plug extended from the sleeve to the inside of the stein. This plug is then expanded flush against the inside of the stein holding everything in place. Pewter from a faience stein of Berlin c.1735. Note the hinge rosettes or skirts and all the pewter is tied together into a single unit. Another stein of Berlin c.1725 was the source of this fantastic pewter. Pewter repair to the bottom of a broken handle. Stud through hole in body of stein holds everything in place. Space around stud is sealed with a resin. From another Berlin faience stein c.1750. Pewter from a faience stein of Gmunden dated 1777. I have exactly the same lid and thumblift without the lid ring on a glass stein dated 1788. I called this age Early Biedermeier, but could just as well have called it Early Industrial Revolution or simply the Age of Revolution. In 1776, Britain's American colonies revolted and produced the world's first democratic republic. France soon followed with its own revolution in 1789, but the man responsible for the greatest revolution of his time was a Scot by the name of James Watt who was the inventor of the steam engine which made the Industrial Revolution and the modern world possible. By the 1780's the pewter on steins was already showing the effects of the Industrial revolution. The pewter we now see is similar to that on steins from c.1680 except there is less of it. We no longer find handle support straps and the thumblifts are smaller (See Figure 9). Just as there is little to determine the exact dating of pewter made between 1500 and 1680, there is also little to determine the exact dating of that made between 1680 and 1775 except perhaps by the quantity used and the artistic level achieved. However, from 1800 on and for the next 150 years, a number of changes take place which makes our determination of a stein's age a simple process - comparatively speaking, that is. After the Napoleonic Wars, between 1815 and 1840, while the amount of pewter being used on steins was being reduced everywhere else, a last flash of pewter greatness sprang up in the town of Schrezheim. At the beginning of the 19th century some of the most remarkable pewter ever to grace a beer stein began to appear, first noted on the faience steins produced at the local factory founded in 1752 by wine merchant Johann Baptist Bux. He operated it until his death in 1800 when his heirs took over and operated it until 1833. It was sold to Franz Heinrich Wintergeist whose family had done all the painting of the faience since the factory had originally opened. The factory was one of the last faience producers to close, shutting its doors in 1872. However, the demand for faience had already begun to drop off about the time old Johann passed away and glass was fast becoming the material of choice. Subsequent discovery indicates this remarkable pewter to be the work of Wolfgang Schneider of Regensburg, whose shop was in business from 1805 until about 1850. By mid-century, possibly as a result of the decline of the faience industry, Schneider's pewter fittings began to appear on glass and stoneware steins, while continuing to grace the dwindling faience production. Once you have seen pewter produced in the Wolfgang Schneider pewter shop you will always be able to identify it, it is that distinctive. Figures 10, 11 and 12 are all samples of Wolfgang Schneider's pewter from this time period. Figure 10 is on a stoneware stein, c.1820. In addition to the hinge skirts, note that the hinge has been cut to look like meshing gears. Figure 11 is from a glass stein, c.1820, and Figure 12 on a cold-painted faience piece c.1830. All three have footrings decorated to match the lids. Pewter from a stoneware stein of the Westerwald c.1825. Faience was devised as a substitute for porcelain, but now that porcelain had been available for about 100 years the faience factories were shutting down. Glass was cheap, easy to make, easy to keep clean and was becoming the material of choice. Between 1825 and 1875 glass steins were just about the only kind available. Even the stoneware factories in the Westerwald stopped producing steins around 1825 and except for sporadic production runs in the 1850's didn't produce steins in any numbers until the early 1870's. 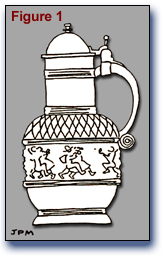 Figure 13 is the pewter from what must be one of the last stoneware steins to come out of the Westerwald about 1825. The pewter is plain, very basic and has a small thumblift. It is a hint of what is to come. Pewter from a glass stein c.1850 made to hold either a glass or ceramic insert. The majority of steins we see from early in this time period are what we call the Biedermeier Wedding Stein, an enameled, 1-liter stein with a wide flared base. 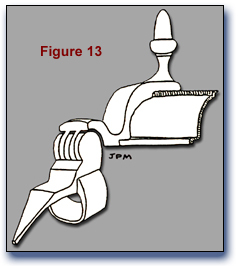 Their pewter is similar to Figure 13 except that they have a larger, urn shaped thumblift. Prior to about 1835 they also had a footring to protect those wide flared bases, but the rising cost of tin took its toll and the footrings disappeared. When they went, the wide flaring bases had to go also. Pewter from a glass stein c.1860-65. Note the thin shank and the small diameter hinge. The lid is the same as Fig. 14, but only two-thirds the diameter. By 1840 we see the .5 liter glass stein, either etched or enameled, becoming predominant. The lids on these steins are now flat slabs cast to appear like they have a medallion inset in the middle. At this point the steins still have parallel walls, but soon many are tapered towards the top to further reduce the amount of pewter required. Finally, about 1850, the lid becomes a simple pewter ring holding either a glass or ceramic insert, and the thumblift is very thin and narrow as in Figure 14. Some still felt a need to reduce the amount of pewter being used even further, and around 1865 we find steins that are tall and narrow so that the lid diameter is reduced even more. 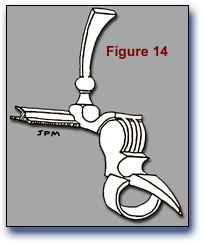 These pieces also have very small diameter hinges and thin shanks as in Figure 15. The Franco-Prussian War of 1870-71 seems to have been a turning point in many ways. Whatever the reason, the price of tin must have fallen dramatically, and the stoneware factories felt it was time to re-introduce the stoneware stein. By 1875 we find factories, in both the Westerwald and Regensburg areas, producing stoneware steins with large, fancy pewter lids and thumblifts. 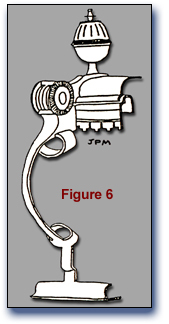 The thumblifts have also been moved back over the hinge as in Figure 16. 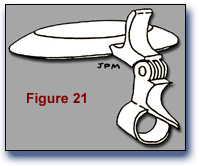 This is also a time of transition from the closed hinge to the open hinge as in Figure 17. Pewter from a stoneware stein c.1875. Note that the thumblift is back over the hinge and that the hinge is still a closed, five-ring affair. Pewter from a glass stein with a four F lid dated 1882. 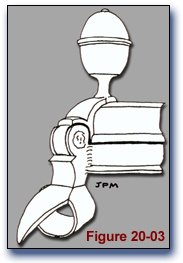 This type of open, three-ring hinge started to come into use c.1875 and continued in use until c.1895. Pewter from a Mettlach stein c.1900. Still the preferred hinge today. 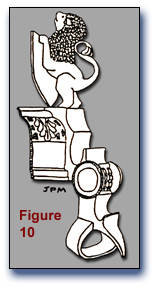 Both of the hinges in Figures 16 and 17 can be classified as c.1875. The first open hinges, as in Figure 17, are the heavy, open three-ring hinges and these were used until about 1895 when the five-ring, open hinge became the hinge of choice as in Figure 18. Don't confuse this puny, open three-ring hinge with Fig. 17. This one was used on export pieces after 1892 and is subject to easy damage. In 1892, International trade agreements were signed requiring countries exporting goods to mark them with the name of the country of origin. Germany produced a plethora of cheap steins for export, which had pewter fittings of very small dimensions that, I am sure, did not meet the fineness requirements for pewter being sold in Germany. 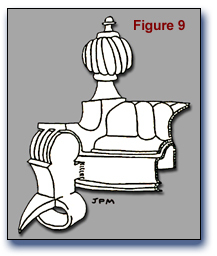 The pewter is very soft and has a tendency to bend or break quite easily (see Figure 19). Although this is also an open, three-ring hinge, don't confuse it with the one produced between 1875 and 1895. These puny fittings of low-grade pewter were used on export steins from 1892 until at least World War I. Figure 20 is how you will, quite often, encounter this fitting. Just as the September 1993 issue of Prosit, which contained my article "Pewter Fittings Through The Ages," was being mailed, I discovered a pewter fitting I had never encountered before. In one of the stein sales rooms at the Minneapolis Convention, I ran across a blue and gray stoneware stein c.1870-1880 that appeared to be from the Reinhold Hanke factory. This stein had a heavy, three-ring hinge like those I attributed to 1875-1895, but it was closed on the ends rather than open. A closed, three-ring hinge; I had never heard of one before, much less seen one. The stein had been broken, and glued back together, so I passed on it at the time and simply made a note of the unusual hinge and the approximate date of manufacture. I recently acquired another piece from the Reinhold Hanke factory, a blue and gray stoneware jug from the 1870-1880 period, and there, much to my surprise, was that elusive, closed, three-ring hinge (See Figure 20-01). Since then, I have also acquired a glass stein with an inlaid porcelain lid that is c.1870-1880, which also has a closed three-ring hinge (See Figure 20-02). Closed, three-ring hinge c.1870-1880. Another closed, three-ring hinge c.1870-1880. The existence of this hinge presents us with two questions: Where exactly does it fit into our chronology, and why are there so few of them? I can only theorize, but I think the following answer is pretty close to the mark. Not knowing where the glass stein was made, or who made it, I'll have to use the Hanke piece as the benchmark. Reinhold Hanke launched his stoneware business in 1868. And by 1875, like everyone else, he was fitting his steins with open three-ring hinges. That means that this type hinge was used sometime between 1868 and 1875. My personal belief is that the window is much smaller. 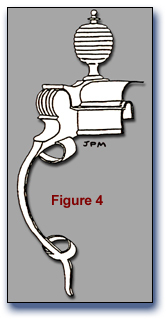 Perhaps, as the majority of pewterers were changing over to the open three-ring hinge, a small number of pewterers wanted to retain the clean, finished appearance of the closed five-ring hinge. They adapted the process to their needs, only going to the open three-ring hinge when the shortcomings of closed three-ring hinges were discovered. 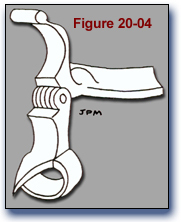 There are probably three reasons for the scarcity of this hinge; first is the short period in which they were produced, second is the small number of pewterers who might have used this hinge, and the third is the fact that these hinges are susceptible to rapid failure, obviously, something that was quickly recognized and corrected. Closed, three-ring hinge c.1749. Lid, tang, upper hinge and thumblift single-cast, open-hinge style c.1934-45. 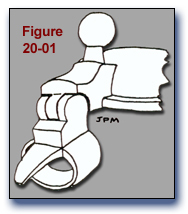 Figure 20-03 is a very early, closed three-ring hinge that I've included simply as a point of interest as it is certainly an exception from the norm. 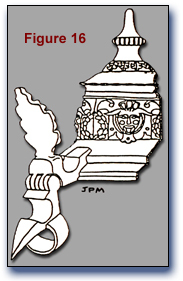 This hinge is on a 1.75 liter stoneware stein attributed to Saxony and dated 1749. The pin extends through all three rings and is soldered into place on the thin outer rings, leaving the thicker, inner ring to pivot on the pin. Even with the thin outer rings, this appears to be quite a strong hinge. 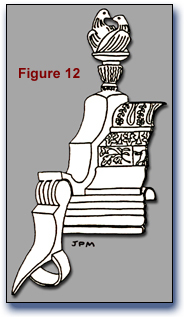 Figure 20-04 is from a Third Reich stein and is typical of the 1934-45 period. This is another style that, while I was aware of it, overlooked it and left it out of my original article. What makes this pewter different is the fact that the lid, the tang, the thumblift, and the upper portion of the hinge are cast together as one piece. Quite a process improvement for the time, as it eliminated several steps in the lidding process, thereby increasing production and reducing costs. Results typical of a wartime economy. Fittings from a post World War I stein. The lid is nickel plated metal, used primarily from 1919 to 1924, and 1934 to 1939. 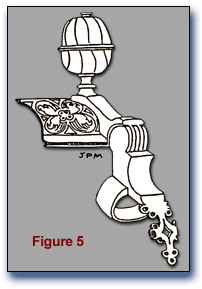 In the mid 1890's the open, five-ring hinge came into use as we saw in Figure 18, and this hinge is still the predominantly used hinge today. After World War I, Germany found it couldn't buy tin because it was classified as a strategic material. What tin or pewter Germany had on hand was needed for other purposes, and so many beer steins ended up with nickel plated metal lids like the type in Figure 21. This lid is found off and on right up through the end of World War II. The majority of these are found on steins produced between 1919 and 1924 and again from 1934 through 1939. Pewter is c.1950. Note the curved shape of tang to thumblift. Lid is probably marked D.B.G.M. inside. 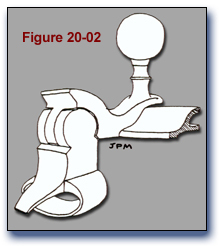 While we find all kinds of hinges and fittings being used today, the fittings in Figure 22 are some of the most common postwar fittings and are c.1950. Note the use of a closed, five-ring hinge. This does not mean it was made prior to 1875. Another feature to be aware of is the sweeping curve from the tang right up to the tip of the thumblift. This pewter exhibits casting and stamping marks, is overly shiny, and usually marked inside the lid with the letters D.B.G.M. Most modern pewter from about 1960 on has a velvety, sandblasted texture to the surface and the hinges are often rough appearing with what seem to be file marks. Gruhl, Jim and Kirsner, Gary. The Beer Stein Book, Glentiques, Ltd., Coral Springs, FL., 1990. Hornsby, Peter R.G., Pewter of the Western World, 1600-1850, Schiffer Publishing, Ltd., Exon, Pennsylvania, 1983. Reinhart, Kurt F., Germany.- 2000 Years, vol. 11, The Continuum Publishing Co., New York, 1961. Webster's Encyclopedic Unabridged Dictionary of the English Language, Chronology of Major Dates in History, Gramercy, Books, New York, 1989. Vogt, Peter - Fayence und Steinzeug aus vier Jahrhunderten - Jubilaeumskatalog Zehn Jahre Kunsthandel, Peter Vogt - Antiquitaeten im Rathaus, Marienplatz 8, 80331 Muenchen . Original Articles published in PROSIT September, 1993 and PROSIT September, 1996. Articles combined and graphics re-worked for online publishing, February 2000 by Ginger Gehres. Layout further revised in May 2004 by Walt Vogdes.